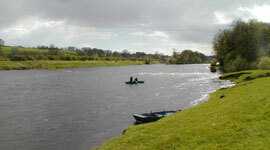 The Upper Hendersyde beat on the River Tweed is situated at Kelso in Roxburghshire immediately below the Junction beat and above the Sprouston beat. It comprises approximately one mile of double bank fishing with four excellent holding pools, Upper Winter Cast, Winter Cast, Mill Stream and Ferry. There are two boats on the beat and the fishing is for three rods. There is a full time ghillie on the beat, Mr Ronnie McElrath, and his services are included in the rent. This beat is normally let by the week for a maximum of three rods, very occasionally half weeks will be let, rarely are day lets available for this beat at this time of year.